I am pulling out an old lesson post here because it was just so successful last year! Students in grades 4-6 have been working on Rotational Symmetry drawings for the past three class periods. This is one of the many math concepts that directly connects to the visual arts. 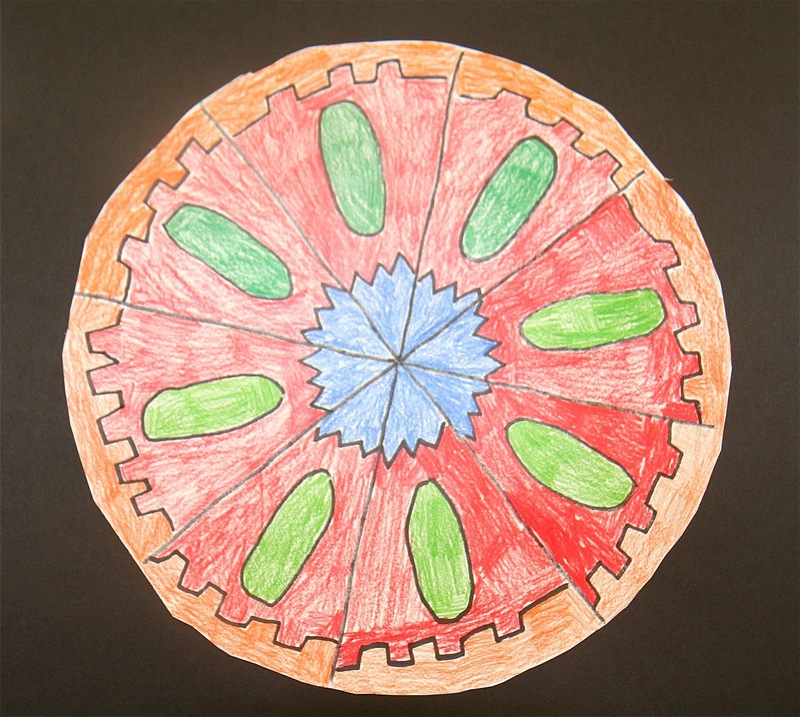 I love teaching this lesson because the results are stunning, the kids feel confident about their work, and they want to work hard for the final product (which is sometimes a challenge for the 6th graders). I have the students create a simple drawing on 1/8 of their circle, then teach them how to "transfer" their drawing into all 8 parts of their circle by putting pencil led on the back of the piece of paper and tracing over the original drawing 8 times. 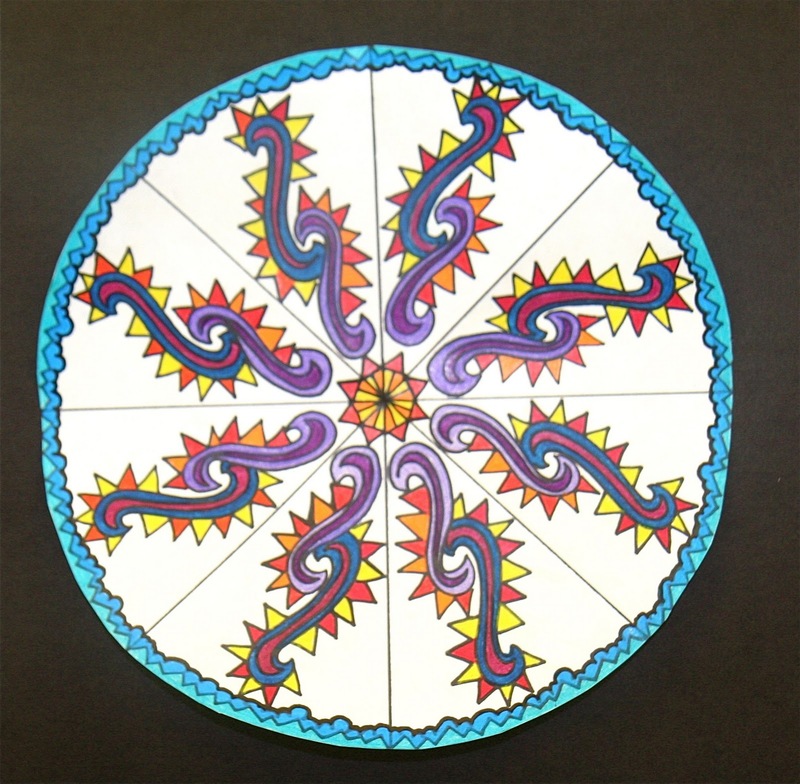 We also discuss some techniques of using colored pencils, like graduated coloring, shading, and blending colors together. pressing hard to transfer the lead from the back onto the paper. 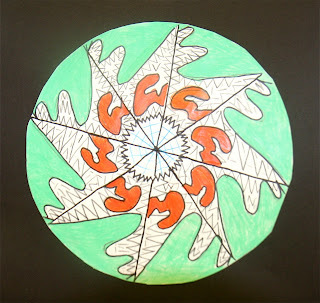 I'm a 4th grade teacher and this looks like a really great art project to reinforce the idea of rotational symmetry. Could you give some more specific steps as to how you teach them to create these? What kind of paper do you use? Just regular white paper that they can see-through and trace? How big is each circle? Do you give them a template? Sure. 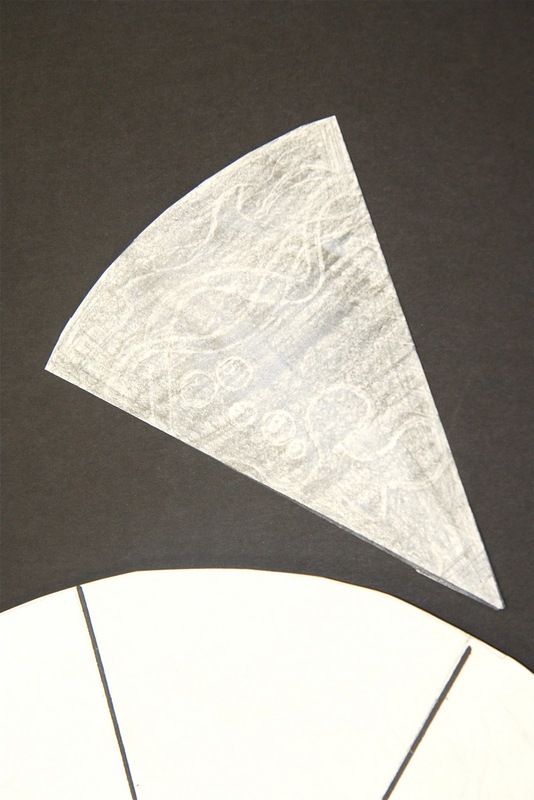 We start with a 12" circle on regular drawing paper. 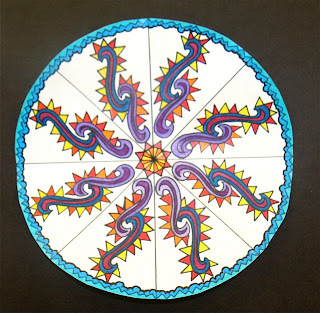 We fold the circle until we have divided it into 8 equal parts and trace over each line with a Sharpie marker. Then, I give them 1/8 of a circle - a separate piece of paper (I refer to it as a piece of pizza, whereas the large circle is the actual pizza). 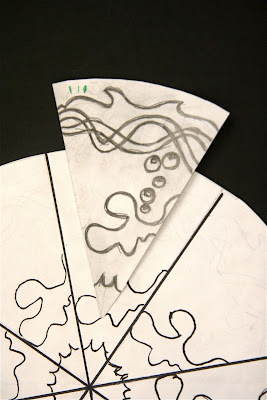 On their slice of pizza, they are to create a simple line drawing using a few shapes and lines - not too complicated. I encourage them to make their design reach the left and the right of the slice of pizza so their design is continuous. 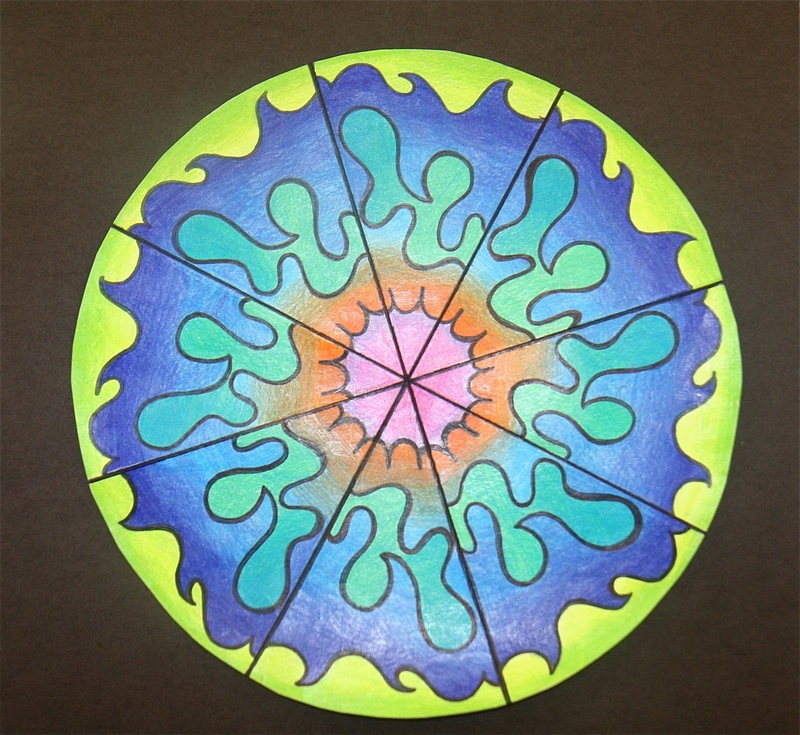 Next, I teach them to transfer their drawing onto each slice of pizza on their circle. 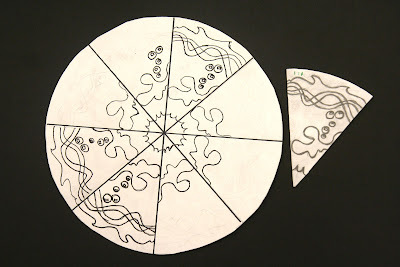 To do this, they need to fill the back side of their design piece with pencil lead, lay the design face-up on the pizza, then trace over their design pressing really hard with a pencil. This transfers the design onto the circle paper. The transfer will be light, so they need to trace over their lines with a black marker. Thanks for such a great tutorial:) I used it on my blog too. Thank u so much for sharing. Im going to use this with my year 5 next monday!